The official start of Spring is just a few weeks away and as the weather warms and spring fever strikes your soul, think about stepping into the gardening season with strawberries. Strawberries are adorable because they are so adaptable and can be grown in almost any climate. 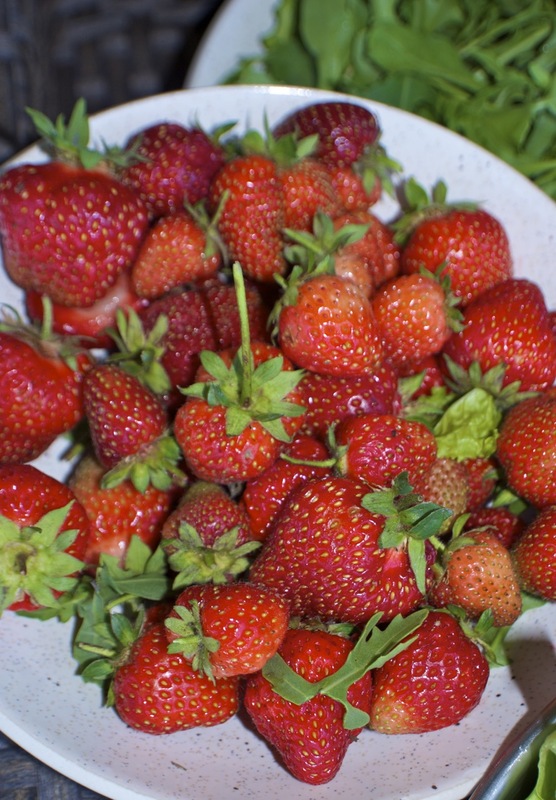 This is one great quality, but do you know about the other fabulous features of strawberries? For instance, the berries are packed with vitamin C, manganese and fiber. 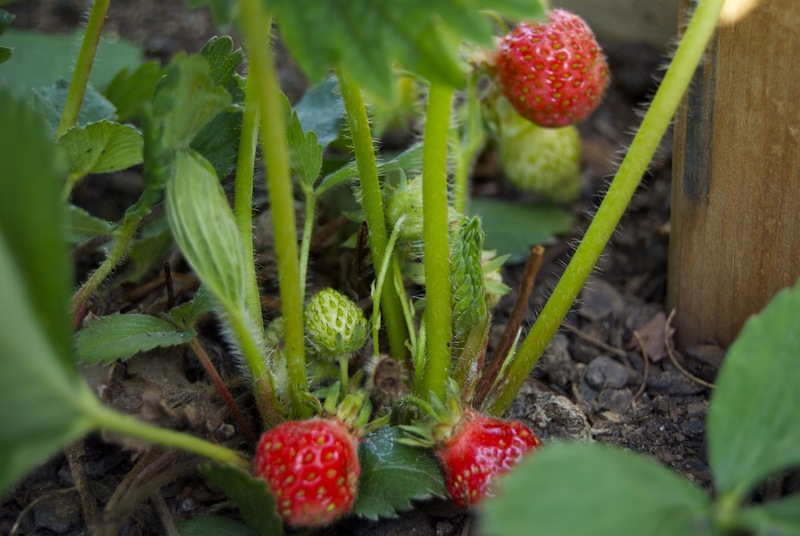 Certain types of strawberry plants produce delicious berries in the first growing season and since they are perennial plants they come back each year (if properly cared for). Also, they can be grown in very small spaces if necessary. Quite a lot to adore wouldn’t you agree? If you’re game for growing strawberries, get started with a trip to a plant nursery. Local nurseries have certified disease-free, bare-root or small plants available now and usually carry varieties well-suited for your particular climate. While there, consider which TYPE of strawberry you want to grow before making your selections. ‘Tri-Star’ is one of my favorite day-neutrals. For “instant gratification” (helpful if you are impatient or have involved kids in your project) choose some Day-neutral or Ever-bearing types, that produce sweet, medium-size fruit during the first summer. June-bearing strawberries are another type, offering great flavor and the biggest berries, but they typically will not produce until their second summer in the garden. A fourth type, is the Alpine strawberry. These plants produce small, intensely flavored berries that are red, white or gold. Once you’ve picked plants, decide how to grow them. Remember how strawberries are adaptable and can be grown in small spaces? This means they can flourish in hanging baskets, containers, raised beds or even unconventional objects lIke rain gutters! If you have a raised bed available, this is a great option for strawberries and they tend to thrive in this environment. However, if that option is not available, how about a container, maybe even an “official” strawberry pot. 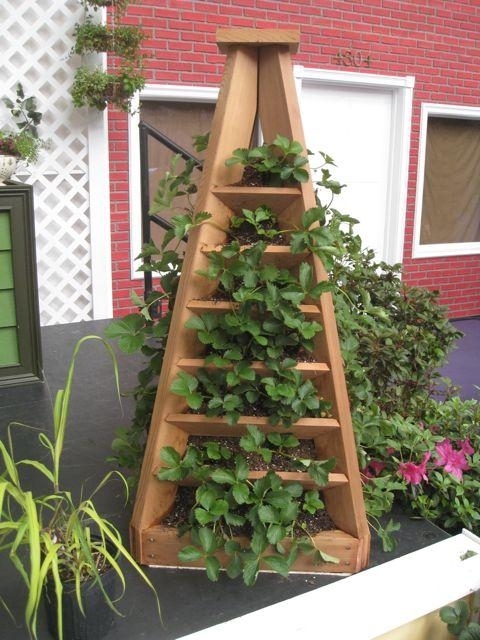 The growing method I’m trying this year is a wooden strawberry tower. 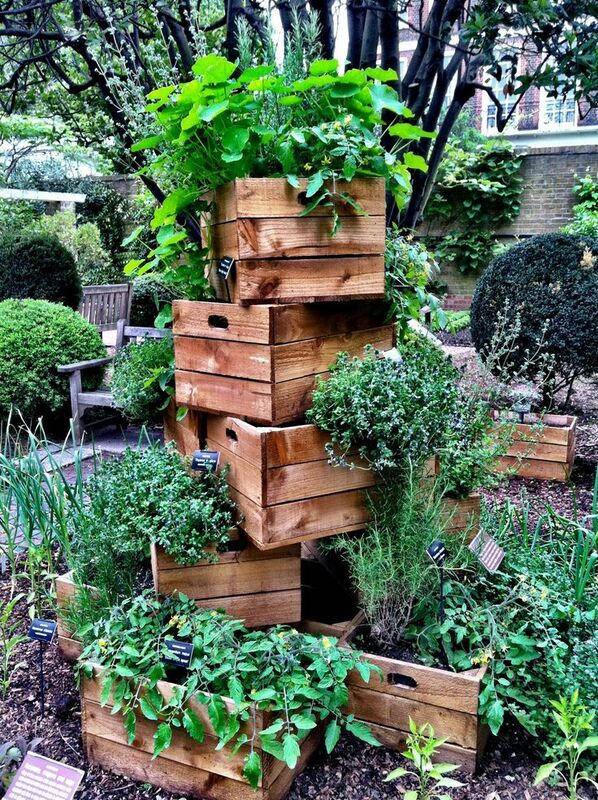 The tower method can be constructed in a few different ways but is usually in the form of a pyramid, enabling space efficiency and the benefit of keeping berries off the ground, away from slugs or other hungry ground rogues. (Plans for a robust wooden strawberry tower can be found at myoutdoorplans.com) Here are some options for the tower method. Photo courtesy of Bruce Post Co. 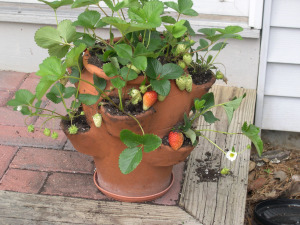 If you are an ardent DIY-er, a fun idea for growing strawberries is to re-purpose an old rain gutter as a container. A 4-5’ length of rain gutter can be used for 4-5 plants. The main steps include drilling drainage holes every 4-6 inches, on the bottom of the gutter and then capping the ends. Once the ends are in place, caulk the end-cap seams with silicone. Next, plant small strawberry plants about 9-10” apart using a good potting mix. Keep soil a half-inch from the top lip of the gutter so it doesn’t wash out when watering. Elevate off the ground for drainage and even consider mounting to a fence, shed or deck. All of these methods are great for saving space but they will require more frequent watering than raised bed or in-ground plantings. If you have plenty of space and well-draining soil, just plant in-ground. A tip for this growing style is to rake soil into raised mounds at planting time and then place one plant per mound. This slightly raises the plants improving drainage and providing some protection against rot and pests. Below is a simple reference guide to help insure success in growing and caring for strawberries in the Intermountain West. Plant now and enjoy garden deliciousness in just a few months! Nutrition: Strawberries are a good source of Vitamin C, manganese and dietary fiber. They are also packed with antioxidants. Growing Conditions: Strawberries need a minimum of 8 hours of sun and loose, well draining soil. A moderately fertile, enriched soil produces good yields. Spacing: 12”-18” apart. If planting in rows, allow for 3’ in between rows. *How to Plant: Depth is important in planting strawberries. Make sure the hole is deep enough for roots to be positioned straight down, not spread out. The crown (where the roots meet the shoots) MUST NOT be buried and should be planted so just half of it is under the soil line. The top of the crown should be exposed to water and light. Water each plant individually right after planting. Watering needs: Keep soil evenly moist but not waterlogged which can encourage disease. Drip or hand watering is a good choice. If overhead sprinklers are used, water early in the morning to allow foliage to completely dry by nightfall. Care: Pick strawberries frequently during the harvest season. Do not let fruit rot on the vine. If it does, pick it and discard. Most types of strawberries produce numerous runners with baby plants at the tips. These runners often root themselves nearby, yet remained attached to the mother plant. For best fruit production it is best to clip most of the runners, allowing each plant to produce no more than three baby plants each summer. If planted in rows, renovate your strawberry patch at the end of the season by reducing the width of each row to 12”. 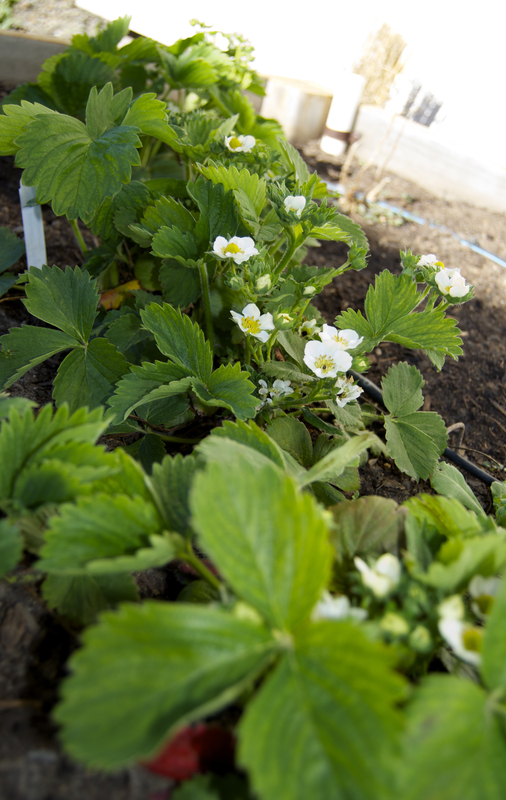 Protect strawberries during winter, by spreading mulch around Dec. 1. Spread the mulch around plants about 1-2” deep. It will prevent the plants from losing moisture during dry spells and protects against root damage caused by freezing and thawing of the ground. Check plants the following March for new growth and once it appears part mulch away from the new leaves. 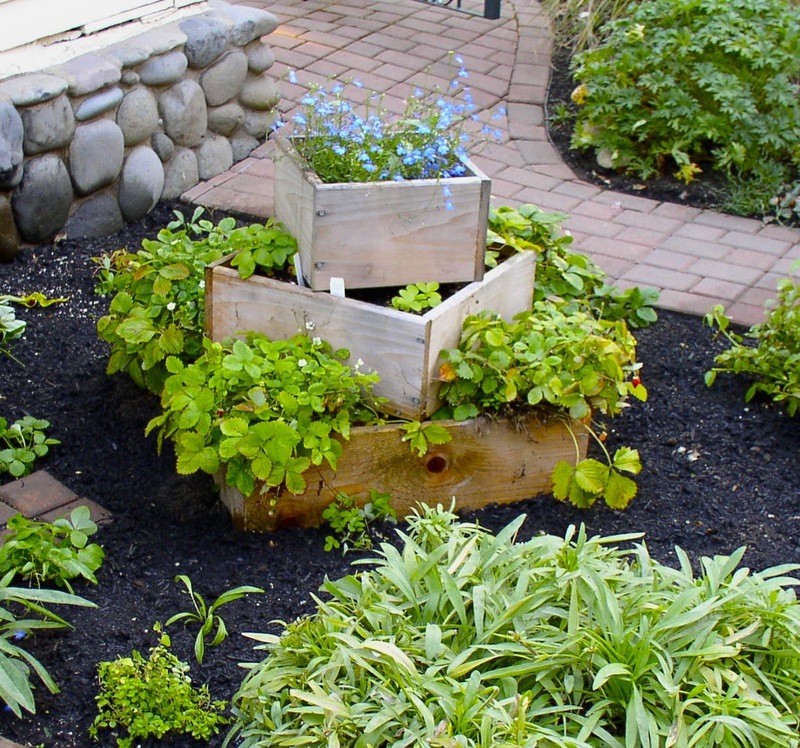 As spring continues, gradually remove the mulch around the growing plant just leaving it in areas of bare ground as a soil mulch. Fun factoid: Strawberries grown in the Intermountain West develop some of the best flavor because the days are long and sunny and the nights cool. This allows berries to develop a lot of natural sugar for severe sweetness! Yum! Wonderful variety of containers and ways to grow strawberries! Now I really can’t wait to dig in our gardens this Spring. Can’t wait until spring warmth arrives here in the northeast. 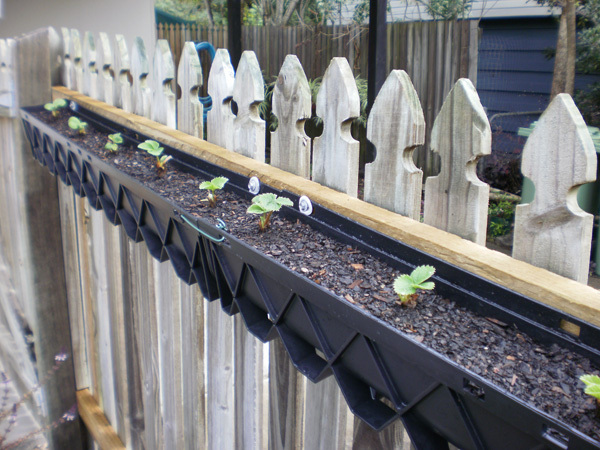 Love the idea of using a gutter as a planter along a fence. Hi Karen, Thanks for stopping by… Is the snow starting to melt for you yet? We have unseasonably warm temperatures here in the west but no moisture… Yes, I too like the idea of the rain gutter. I think it would be fun to paint it a color too. I’m salivating…and now have some ideas for growing strawberries beyond the reach of the deer. 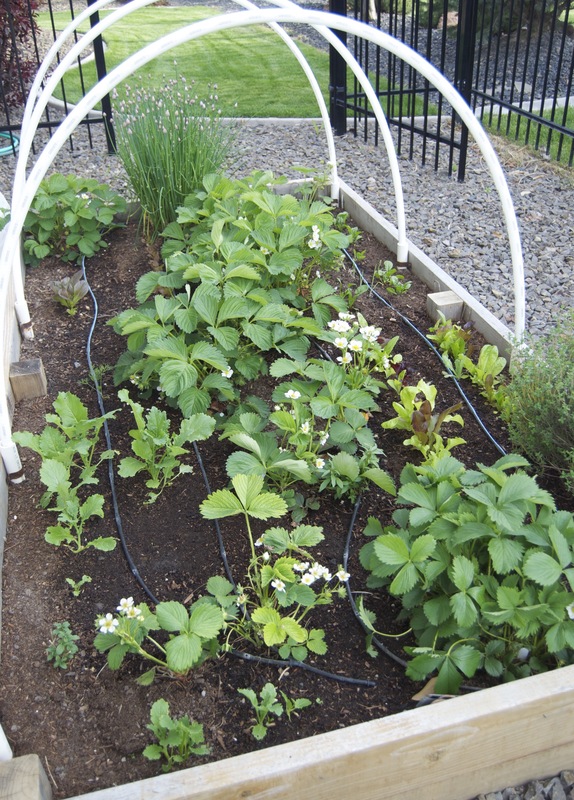 What a great post….I am needing to find some creative ways to grow strawberries. Love some of these ideas…thanks. Really enjoy your creative ideas and now my Spring Fever has gone up 10 degrees!